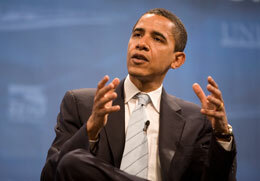 From the moment Barack Obama gave his speech on the 18th of March, 2008, commentators recognized that a rare event had occurred in American political history. Those who thought in political terms believed that this was one of the great Presidential campaign speeches, on the level of the best ever given. Obama’s speech also was judged in the tradition of American statements of equality that begins with the Declaration of Independence and includes the Gettysburg Address and the I Have a Dream speech of Martin Luther King in the summer of 1963. 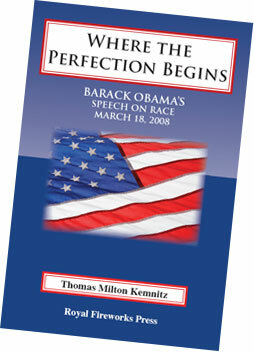 In this book from Royal Fireworks Press, Thomas Milton Kemnitz places the speech in its political and historical context as part of a new national conversation about race. He analyzes the six parts of the speech and examines how Obama conveys his meaning through his vocabulary, grammar, poetic devices and structure. This is a book of great interest to anyone serious about the issue. It provides insight not only to Obama as a speechmaker but also to Obama's approach to questions of race, to social and political conditions and problems and the way forward for the nation. The speech is distinguished by its adult and nuanced approach to the topics he discussed and by its respect for the intelligence of the voting public. The speech was received mostly in silence by its original audience, as befitted its seriousness and complexity. Since then the debate on this issue has been fast and furious on the Internet and in chat rooms. Dr Kemnitz believes the speech will resonate and be remembered for many years to come. For a classroom version of this book see: An Issue This Nation Cannot Ignore.